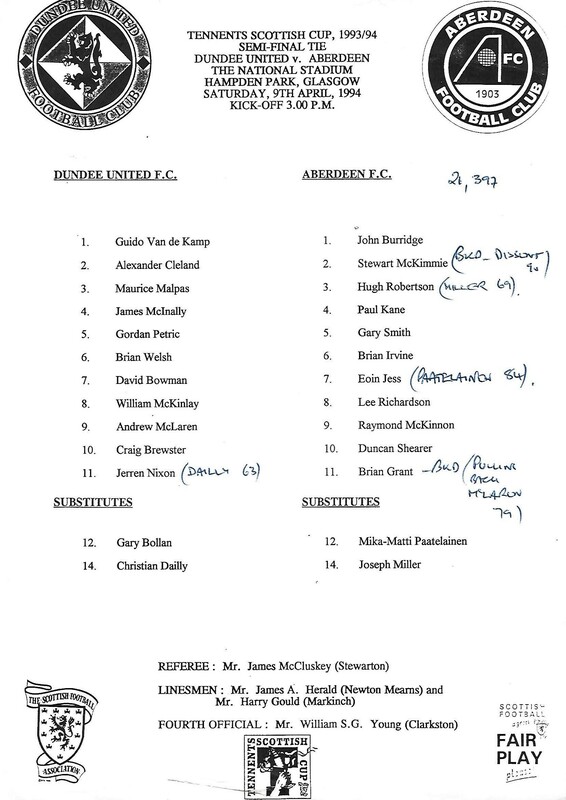 Played at Hampden Park, Manager Ivan Golac sprang something of a surprise, by electing to field both Andy McLaren and Jerren Nixon, which meant Gary Bollan dropped down to the bench with Dave Bowman coming in. The same old tale of Hampden woe appeared to be on the cards as Andy McLaren was denied by first Burridge and then the post, whilst Aberdeen in the first, and one of their few attacks, stole into the lead. The tangerine's almost got off to a flying start when Maurice Malpas floated the ball over from the left and Andy McLaren rose to send in a near post header which was behind Burridge when he clawed the ball to safety with one hand. 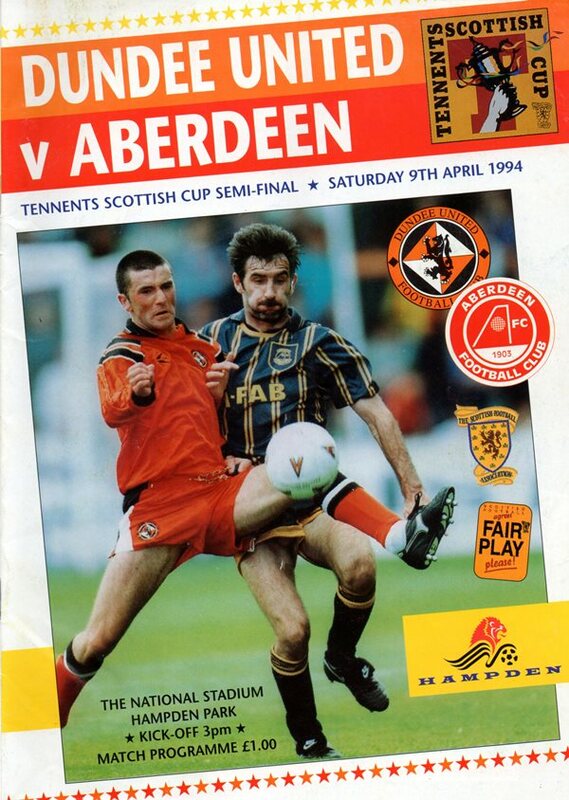 There was almost an action replay of Andy McLaren's header seven minutes later when with the Dons defence under pressure Jim McInally headed a clearance back into a crowded penalty area and Andy McLaren's header this time beat Burridge only to come back off the post! In between times, the Dons had sneaked ahead when McKimmie's first timed a Richardson cross into the box. Duncan Shearer controlled it before turning to shoot. Guido Van de Kamp dropped on the ball, but allowed it to squirm under him and roll over the line to make it a disastrous start to the match. The incident abated there after with neither side making much impression until Richardson hit a drive from the edge of the box which came off one of his own players, but this time Guido van de Kamp made a fine save. United's Dutchman was to be rarely troubled again in the match! Shortly afterwards Gordan Petric curled a 30 yarder just over from a short free-kick. Jerren Nixon, who was starting his first game for almost a month, had a quiet return, but he burst into life early in the second period when he latched on to a deflected Billy McKinlay pass and engineeered an opening from a tight situation, but Gary Smith locked his shot from 12 yards. There was a bizarre incident in the 63rd minute when Ray McKinnon, perhaps remembering his old allegiance, side-footed a volley straight at John Burridge. The referee construed it as a passback and Craig Brewster was crowded out by Burridge as a short free-kick was rolled to him. Christian Dailly had replaced Jerren Nixon as United began to press hard for the equaliser, Billy McKinlay burst through the middle, but skied his shot over the bar when he got near goal. Christian Dailly then met a McInally cross first time, but his shot went past the near post. The pressure was intense around the Dons box and two minutes from the end Dave Bowman flung over a cross and Brian Welsh charged forward to head powerfully past Burridge low at his right hand post. 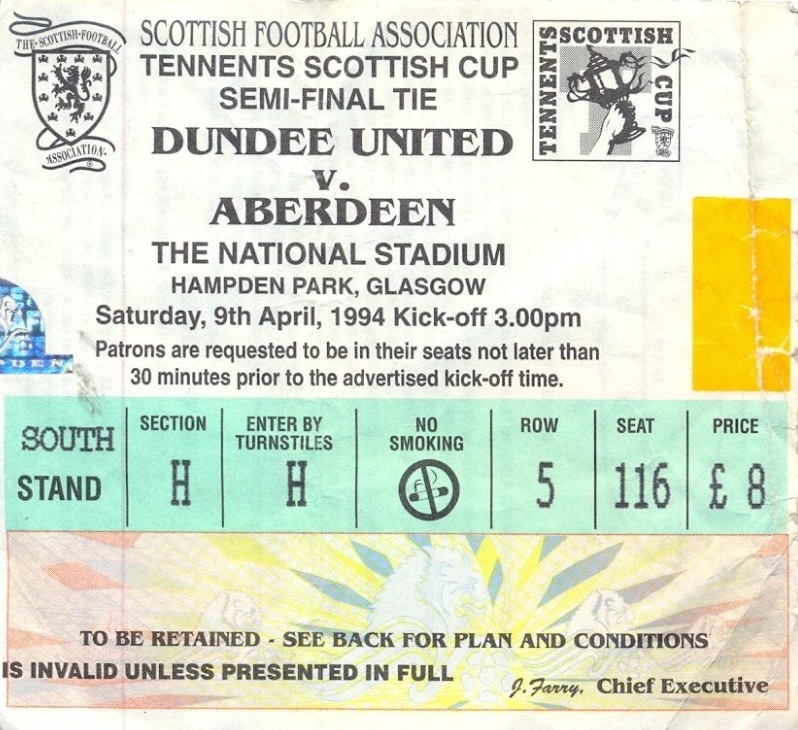 It was no more than United's efforts deserved and indeed Billy McKinlay curled a free-kick round the post two minutes into injury time, but it was back to Hampden three days later.